Kara Lee Corthron won the international Princess Grace Award for her earlier play, Holly Down In Heaven; her latest, Julius By Design, having its world premiere this week, won the very enviable Paula Vogel Award. To win either of these awards means that the play scripts were not only excellently written, but show a strong potential for serious onstage drama and resolution. This one, a full-length two-act play, directed by Debbie Saivetz, is presented by Fulcrum Theater, which, according to its mission statement, "supports playwrights-of-color, for a theater that values new writers and matches the demographic reality of New York City." Its six-member cast features Broadway veterans Suzanne Douglas and Mike Hodge. I spoke with the easy-to-talk-to playwright. Hi Kara Lee. Is that pronounced Car-a or Care-a? How would you describe your play? It's a play about forgiveness in a lot of ways. At the center of it is this older couple. The wife is in her 50s, he's in his 60s. And they've suffered the loss of their teenage son some seven years before. What I was most focused on was the couple, who have known each other for most of their lives. My big question is: with the loss of their son, a horrific tragedy, how do they live their lives day-to-day? What is it like sharing this huge loss? And the play grew from there. Tell me some of the things that happen. The wife, Jo, corresponds with a prisoner in prison, and there are these letters to her. She's basically reaching outside their marriage for an answer. She also makes friends with others in the community; like a young mother who has suffered a terrible loss, and also with a quirky young woman who is a door-to-door knife salesperson. And through these relationships, she realizes what she must do to go on with her life. From a personal viewpoint, this must be a monumental life challenge. It's pretty large. The main conflict is that the husband doesn't want these new influences. He's not willing to let go and move on. The prisoner is in the play. And the husband of the young mother is in it. When I read the press release, I noticed that the parents' names are Josephine and Laurel. Is this a two-woman couple? No. Laurel is a man's name. After a few people brought that to my attention, I realized that all the names in the play are gender neutral, except the son. So Julius would be the teenage son. Can I ask you to explain the title? There are kind of different connotations of the title. 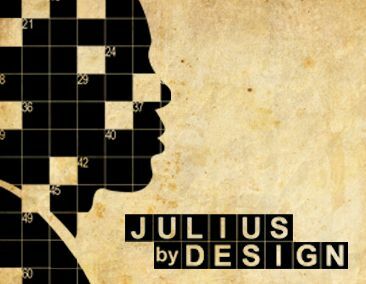 In a general way, it's how people are creating Julius in their minds, or in their lives. I notice the way you use prepositions in your titles; it makes you stop and think. I tend to be a little tricky with my titles. Is the play set in the present time, and a specific place? It's set in the present day. It's funny to say "now," as it could be a few years ago. It's not in a specific place, but maybe it's a suburb of Chicago, or further west. Access Theatre, 380 Broadway, (212) 868-4444. July 10-24. Wed.- Sat., 8 p.m.; Sun., 7 p.m.; added performance, July 5, 8 p.m. Tickets are $18 and available here.